Options - Customize your Macbook Air to select: Condition, Hard Drive, Memory, Optional Windows OS and Battery. Extended Warranty and Insurance must be added at time of purchase. Product Includes - Macbook Air Laptop shipped in heavy duty shipping boxes for maximum protection, battery, AC adapter and power cord, Apple macOS Sierra, optional Microsoft Windows OS and optional Parrallels installed, iSight and iLife installed on hard drive. Paper manuals not included. Electronic versions are available online. This used Mid 2012 Macbook Air from GainSaver is the ideal Mac laptop to take with you everywhere you go. Because its so small and light, youll hardly notice youre carrying it. The refurbished Macbook Air is only 11.8 inches across and 7.5 inches deep. Thats just about the same dimensions as a sheet of paper. And at just .68 inches thick, it feels like its almost as thin as a sheet of paper when you pick it up! For people who are always on the go, this cheap used Macbook Air is just about perfect. If you want your discount Macbook Air to double as a desktop computer when you use it home or at the office, the Thunderbolt port lets you do just that. You can connect to the latest generation of high speed peripherals like external hard drives and monitors that support the Thunderbolt Port interface. The discount Macbook Air also has a built-in Intel HD Graphics 4000 processor for high speed graphics processing. It also gives you super-high resolution when you connect to external monitors. The Mid 2012 Macbook Air is capable of supporting resolutions up to 2560 x 1600 pixels. That turns your tiny 11.6-inch used Macbook Air into a work station when you attach an external monitor. 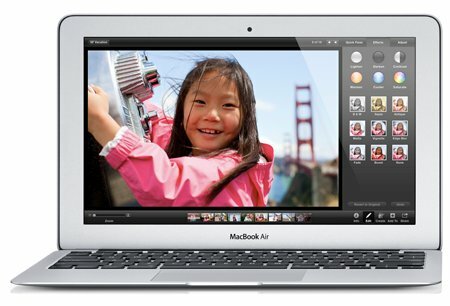 Youll find that the used Macbook Air is incredibly responsive because of its high speed Intel Dual Core i5 processor. Theres virtually no waiting or lag time when you launch programs, switch between applications and load web pages on the internet. You can even enjoy the fastest games, made possible by the Core i5 processor. The high performance of the Macbook Air is a result of clever Apple engineering that integrates the Core i5 processor, graphics processor and memory controller into a single chip. That means that data doesnt need to be moved around as much. The result is that when you use the FaceTime camera or watch videos on your used Macbook Air, theres no more waiting. Everybody loves to make video calls with the FaceTime HD camera. The 11.6-inch Macbook Air is so small youll take it everywhere. So when you travel, you can contact friends and family back home with a FaceTime call and catch up on the latest news. And youll look your best because the FaceTime HD camera has a full 720p resolution with a wide screen format that lets everyone share the screen. The whole reason for taking a laptop with you is so that you can type things and do data entry. So its important that you have a good keyboard thats comfortable and natural to use. And the discount Macbook Air has one. It has a full size keyboard youll find a pleasure to type on. And youll always be able see what youre doing because of the back-lighting that automatically adjusts to the ambient light in the room. When youre sitting in a dark airplane seat youll still be able to see the keys. And when the lights go up, the keyboard back-lighting adjusts so you save battery power. One of the most important reasons to buy your refurbished Macbook Air from GainSaver is that you can custom configure it to your own specifications. When you buy new, youre stuck with the base configuration that is available at the time. So make sure to go through each menu item in the Configurator and set all the options to your satisfaction. Its the best way to save money on the features you need and not paying for the features you dont. Click the Buy Now button when youre ready to check out and order your refurbished Macbook Air. We guarantee your total satisfaction!